Free Shipping Included! Decor MI Vintage World Map Canvas Wall Art Prints Stretched Framed Ready to Hang Artwork Wall Decor for Living Room Office Decoration 16''x32 3pcs by Decor MI at HoldUp Art. MPN: 6003SFBA. Hurry! Limited time offer. Offer valid only while supplies last. 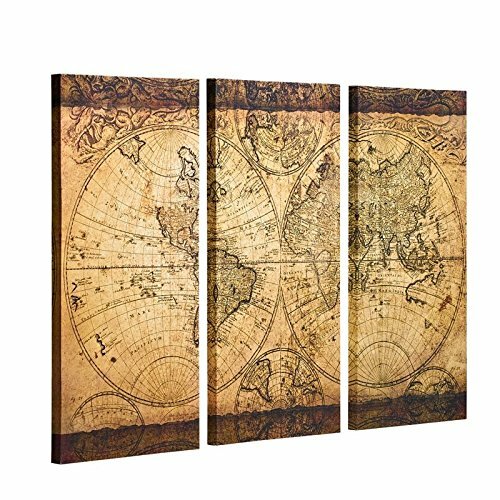 Canvas★VINTAGE STYLE - This wall art decoration depicts a map of the world in a vintage style. Vintage Old World Map. Worldly urban surroundings. ★VINTAGE STYLE - This wall art decoration depicts a map of the world in a vintage style. Vintage Old World Map. Worldly urban surroundings. Fill any space with the spirit of adventure and curiosity. An excellent choice for any boys or girls learning experience. ★HIGH QUANLITY - Each size 16”x32” x3/40cmx80cm x3 (framed, ready to hang),3 panels for one set. High resolution printing on premium artistic canvas, by using a high quality mirrored gallery wrapping technique which extends the picture all the way around the wooden frame. ★ORIGINAL DESIGN - 100% by the professional designer. Perfect wall art decoration for any Home or Office. ★GOOD GIFT - Top quality for home interior decoration idea or gift for friends. colleagues, lovers and families. Give them personality with your favorite quotes, art or designs on posters printed by Decor MI. ★30 DAY BACK MONEY GUARANTEE - If you are not satisfied and want to return the painting for any reason in 30 days after receipt, we will accept it and return your payment. ★HIGH QUANLITY - Each size 16"x32" x3/40cmx80cm x3 (framed, ready to hang),3 panels for one set. High resolution printing on premium artistic canvas, by using a high quality mirrored gallery wrapping technique which extends the picture all the way around the wooden frame.